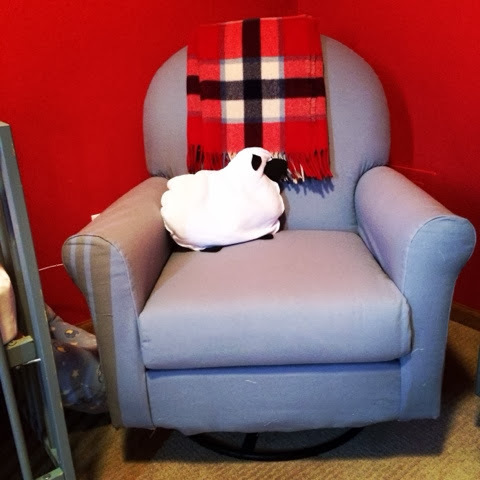 Found this chair for $5 this summer at a yard sale. I thought it'd be great for Wade's nursery. It rocked and swiveled and I could imagine rocking my new little bundle in this chair. Well, this chair with an uplift. I ordered fabric to reupholster with and while six month pregnant I pulled this whole thing apart. It was dirty. Like nasty. So that's why it was $5. Then, in true Moe fashion, I realized I bit off more than I could chew. 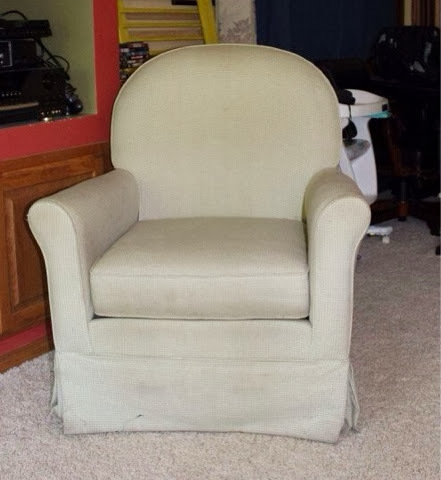 I looked at this chair and thought I could totally re-do it...why would I think that? I am barely adequate to sew curtains and pillow covers, not chairs! So I put it all in a laundry basket and left it until my mom came into town - also true Moe fashion! I still need to put a skirt on it, let's hope I can manage that. The real problem is after watching and helping mom with this I feel like I could do it again...I foresee myself getting into another scrap with delusions of grandure. Now I get to enjoy rocking my little babe - and I'm loving it! Not loving those walls. My next project...or one of them.